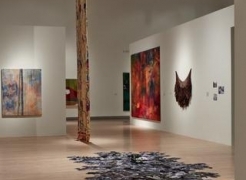 Collection of the Albright-Knox Art Gallery, Buffalo, New York. 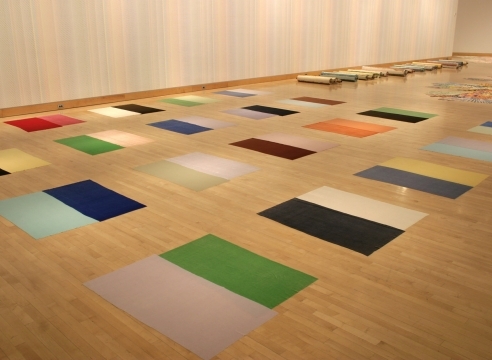 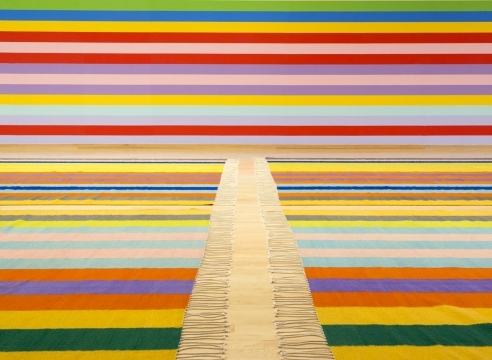 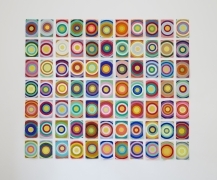 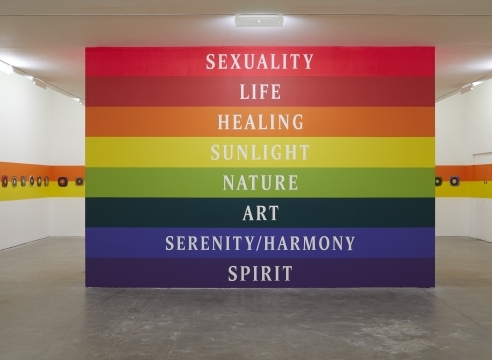 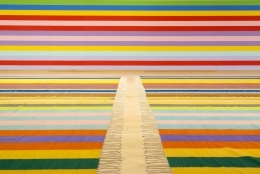 Polly Apfelbaum’s (b.1955) artistic practice is distinguished by a hybridized aesthetic that fuses traditions of painting, craft, and installation. 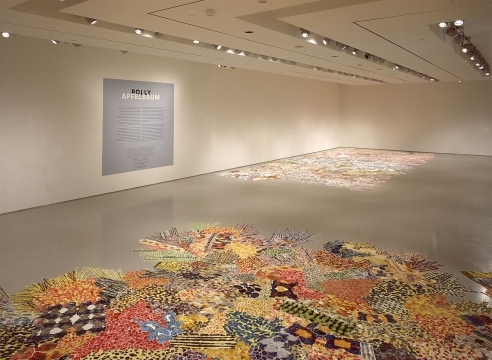 Deploying a wide variety of media—including fabric, paint, dyes, wallpaper, plasticine, and ceramics—her work dissolves spatial, plastic, and temporal boundaries. 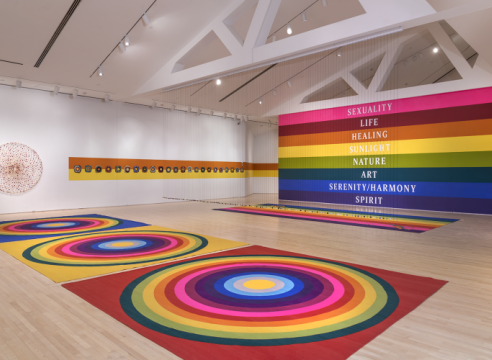 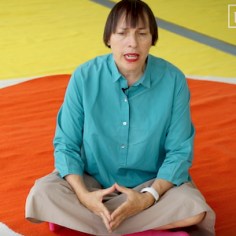 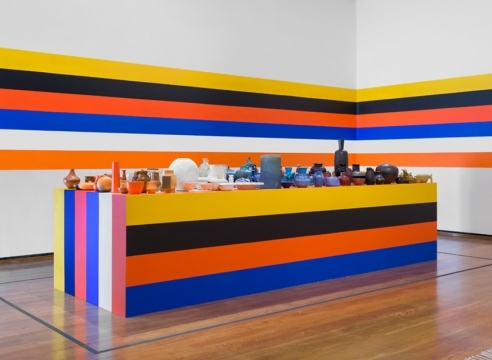 She is best known for expansive polychromatic installations, which coalesce the radical and the beautiful, simultaneously domestic and irreverent. 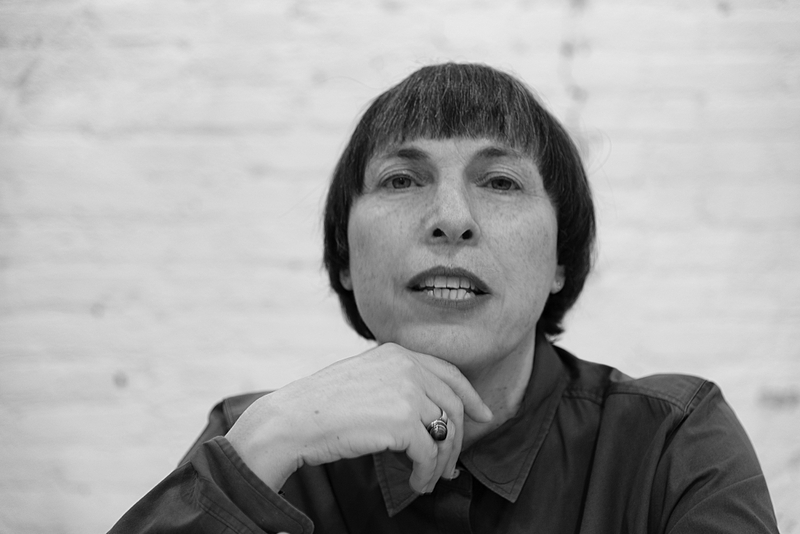 Her sensibility is informed by an encyclopedic knowledge of the applied arts, art history, and popular culture. 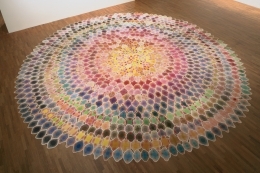 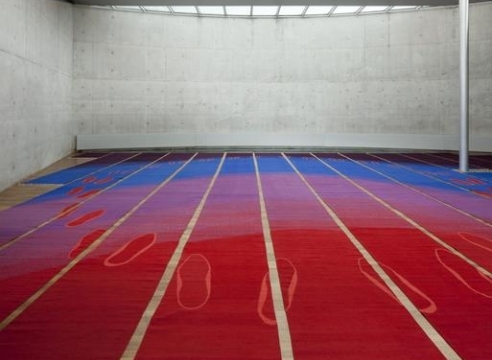 Active since the mid-1980s, Apfelbaum uses found references associated with craft traditions to create sculptural objects and sprawling floor-based installations. 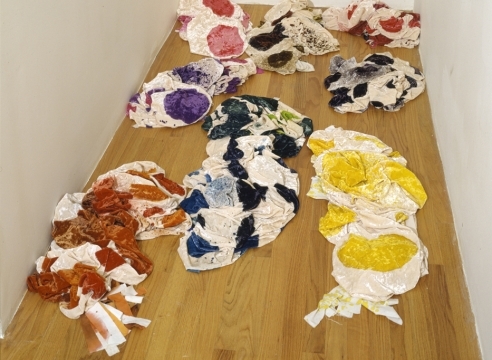 She has drawn on the aesthetics and principles of the Italian Arte Povera movement, French Supports/Surface movement, and First-Wave Feminist art, and her material choices are often associated with craft and women’s work, including dyed fabric, shredded paper, felt, and crepe paper streamers. 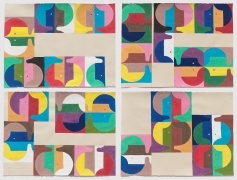 Connecting process and materials is a determined injection of vibrant and improvisational color, reflecting her passion for twentieth-century design and painting. 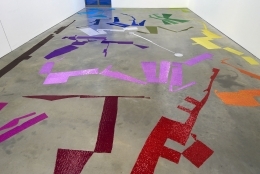 With awareness of how her floor-based installations draw from classic traditions of fine art, Apfelbaum defines staining and dyeing as acts of painting; cutting, a way of drawing in space; and assembling the cut pieces a sculptural practice. 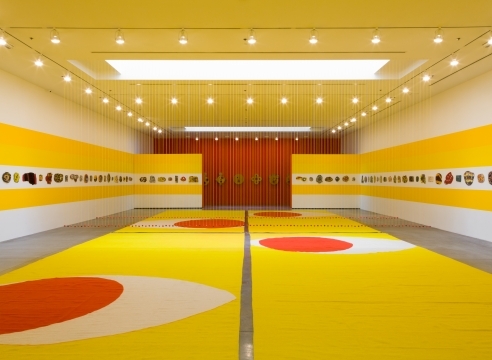 In recent years, Apfelbaum has created immersive environments that extend her interest in the cultural aspects of color, design, and multi-sensory experience. 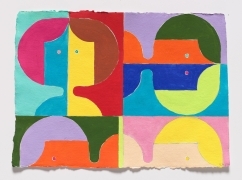 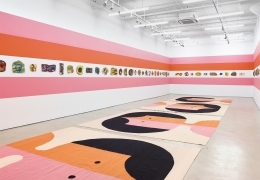 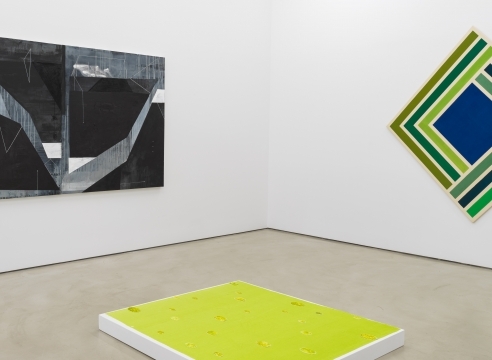 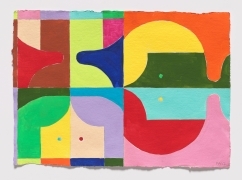 In The Potential of Women at Alexander Gray Associates, New York (2017), she presented an installation of rugs, ceramics, and gouache drawings based on Rudolph deHarek’s cover design for the 1963 book The Potential of Woman, a collection of texts from a San Francisco symposium that year. In a challenge to the implicit patronizing attitude of the original, Apfelbaum focused on the appreciation and empowerment of women in the present. 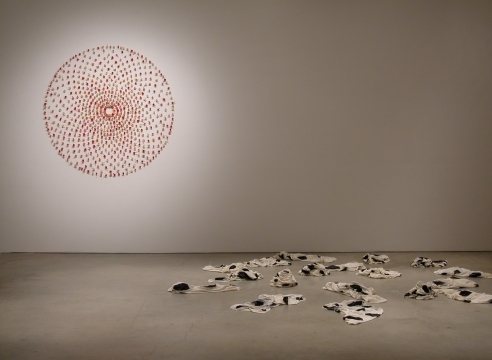 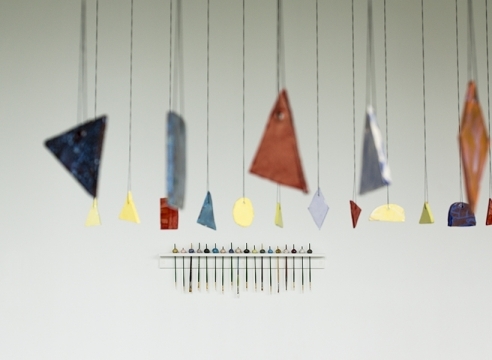 In Face (Geometry) (Naked) Eyes, shown at Otis College of Art and Design, Los Angeles (2016), rugs, ceramics, and curtains of suspended ceramic beads created an environment devoted to spirituality inspired by wide-ranging sources including an Italian Romanesque mosaic and the 1960s New Age movement. 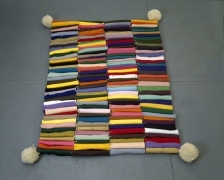 Rugs have become a central part of Apfelbaum’s oeuvre, first explored for the 1997 group exhibition Woven in Oaxaca at A/D Gallery in New York, where she began an on-going collaboration with a Mexican weaving workshop that produced hand-dyed and hand-woven rugs according to her designs. 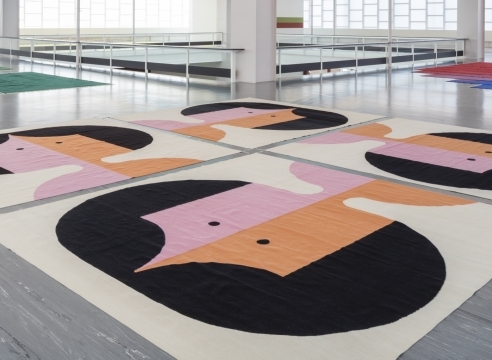 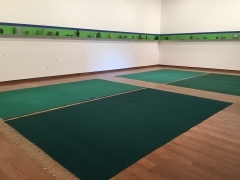 In 2018, the solo exhibition Happiness Runs at Belvedere 21, Vienna, Austria, brought together large-scale rugs from six exhibitions in a survey of recent projects. 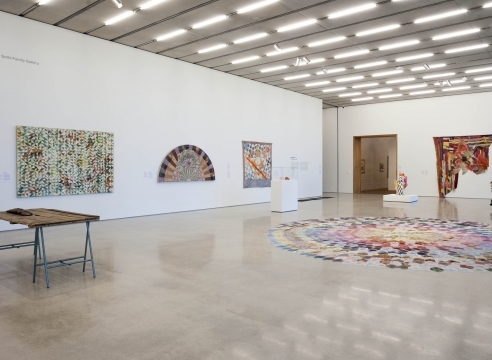 That same year, Waiting for the UFOs (a space set between a landscape and a bunch of flowers) at Ikon Gallery, Birmingham, England, and, in 2019, at Kemper Museum of Contemporary Art, Kansas City, MO, featured ceramics along with rugs and gouaches. 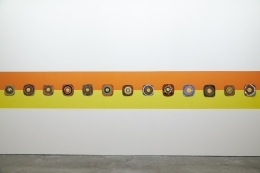 New to Apfelbaum’s favored mediums, each ceramic is handmade and unique, with the artist embracing the accidents inherent to the processes of glazing and firing. 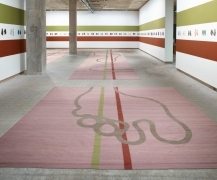 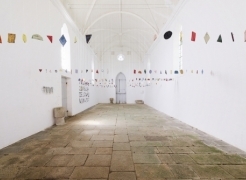 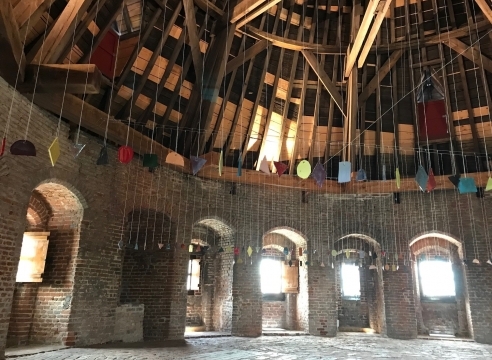 In 2019, Apfelbaum’s work is featured in a solo presentation at the Quebec City Biennial, Canada. 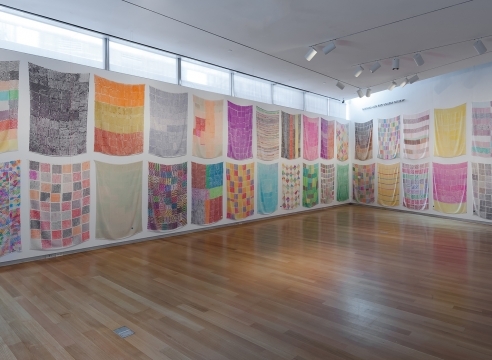 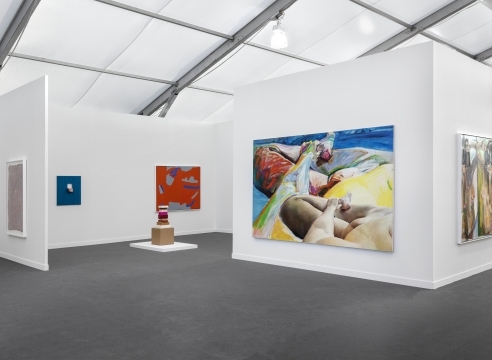 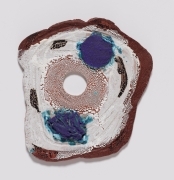 She has exhibited widely since the 1980s, including one-person exhibitions the National Museum of Women in the Arts, Washington, DC (2017); Otis College of Art and Design, Los Angeles, CA (2016); Bepart, Waregem, Belgium (2015); Worcester Art Museum, Worcester, MA (2014); lumber room, Portland, OR (2014); and Mumbai Art Room, Mumbai, India (2013). 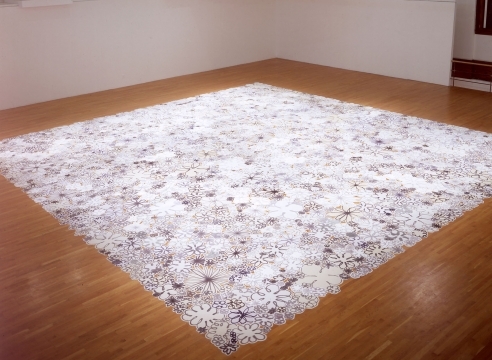 A major mid-career survey of her work opened in 2003 at the Institute for Contemporary Art in Philadelphia, PA, and traveled to the Kemper Museum of Contemporary Art, Kansas City, MO, and Contemporary Arts Center, Cincinnati, OH, both in 2004. 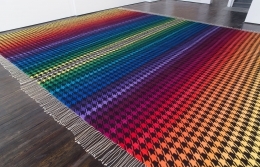 Her work has been featured in numerous group exhibitions including Pattern and Decoration, Ornament as Promise, Ludwig Forum für Internationale Kunst, Aachen, Germany (2018); An Irruption of the Rainbow, Los Angeles County Museum of Art (2016); Wall to Wall, MOCA Cleveland, Cleveland, OH (2016); Pretty Raw: After and Around Helen Frankenthaler, Rose Art Museum, Waltham, MA (2015); Three Graces, Everson Museum of Art, Syracuse, NY (2015); Pathmakers: Women in Art, Craft and Design, Midcentury and Today, Museum of Art and Design, New York (2015); AMERICANA: Formalizing Craft, Perez Art Museum Miami, Miami, FL (2013); Regarding Warhol: Sixty Artists, Fifty Years, Metropolitan Museum of Art, New York, (2012); Lines, Grids, Stains, and Words (2008), Comic Abstraction (2007), and Sense and Sensibility: Women and Minimalism in the 90’s (1994) all at The Museum of Modern Art, New York; Extreme Abstraction, Albright-Knox Art Gallery, Buffalo, (2005); As Painting: Division and Displacement, Wexner Center for the Arts, Columbus, OH, (2002); and Operativo, Museo Rufino Tamayo, Mexico City (2001). 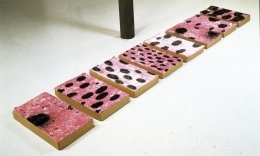 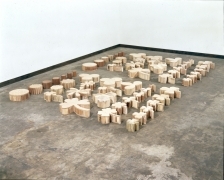 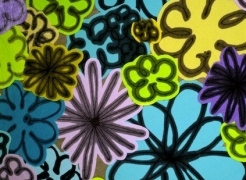 Apfelbaum’s work is in numerous permanent collections including the Albright-Knox Art Gallery, Buffalo, NY; Blanton Museum of Art, Austin, TX; Brooklyn Museum, New York; Carnegie Museum of Art, Pittsburgh; Dallas Museum of Art; Everson Museum of Art, Syracuse, NY; Los Angeles County Museum of Art; Museum of Contemporary Art Chicago; The Museum of Modern of Art, New York; Pennsylvania Academy of Fine Arts, Philadelphia, PA; Pérez Art Museum Miami; Philadelphia Museum of Art; Princeton University Art Museum, Princeton, NJ; Tang Teaching Museum, Saratoga Springs, NY; and Whitney Museum of American Art, New York. 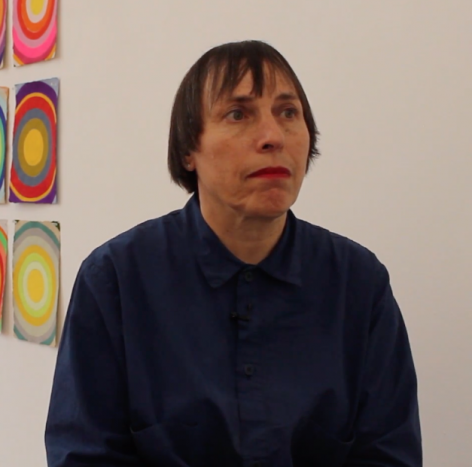 She was the recipient of a Pollock-Krasner Foundation Grant in 1987, a Guggenheim Fellowship in 1993, an Artist's Fellowship from the New York Foundation for the Arts in 1995, an Anonymous Was a Woman Award in 1998, a Richard Diebenkorn Fellowship in 1999, a Joan Mitchell Fellowship in 1999, an Academy Award from the American Academy of Arts and Letters in 2002, and the Rome Prize in 2012.